We took the opportunity of living next to a small sheep farm in the Navarran Pyrenees to find out how our neighbour makes cheese. She has about a hundred sheep and makes cheese in her kitchen every couple of days. It’s a surprisingly simple procedure, requiring little equipment. The cheese is left to drain for 24 hours, then put in a cheese press and squeezed further before being brined and left to mature for two months. 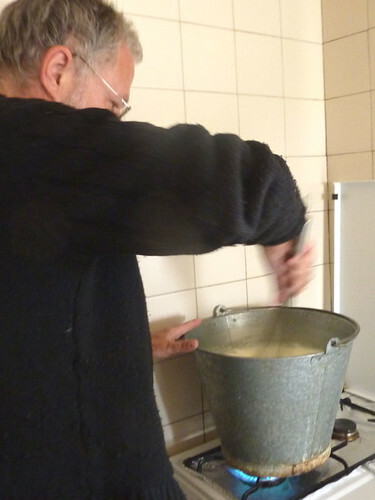 The resulting cheese will keep for up to a year. 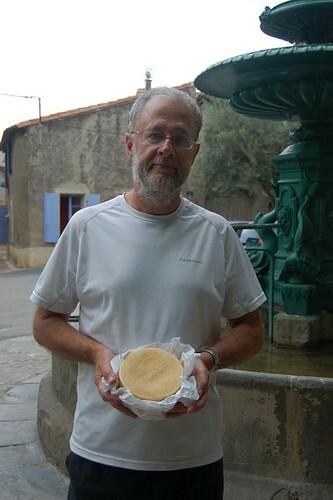 Update: and here is the proud cheesemaker with his mature cheese! Next lesson: how to make cuajada, a very simple and delicious fresh sheep’s cheese made in clay pots that’s often served as a dessert with honey or sugar. I’m going to gather some nettles to make my own rennet for this.